Terminal ballistics is the science of what happens when the bullet strikes the target (and thus the mechanism of incapacitation). For a very long time this field was based on myths, misunderstandings, and in many cases outright misstatements. It wasn’t until accurate and consistent tissue simulants and modern high speed x-ray photography started to be utilized that much of what happens began to be understood more fully. Even today there is still a lot of terminal “bull-istics” being put forth by self-styled experts based on so-called “street data,” pet theories of the proponent, and some cases even manufacturer’s incentives. However, those who have taken the time to research the subject and who understand the medical principles involved have learned to separate the bull from the bullets. Note that while we are primarily talking about projectiles used in self defense the principals hold for hunting ammunition. There ain’t no magic bullets! Make the biggest diameter hole you can to let blood out and air in. Small bullets may expand, but big bullets never shrink. Make the deepest hole you can to insure that vital organs and nerve centers can be reached and destroyed from all impact angles. “Service” your threat until it is no longer a threat. No small arm can guarantee 100% instant incapacitation of a determined adversary - man or beast. Most gun writers are pathological liars. Armor Piercing - A bullet constructed of hardened material or carrying a hardened core specifically designed to penetrate bullet resistant, or armor-plated targets such as tanks, trucks, and other vehicles. Depending on the definition used for “armored” any small arms ammunition could be considered armor piercing. As an example, a target designed to resist pistol ammunition can be penetrated by rifle ammunition, or a target designed to resist rifle ammunition can be penetrated by a heavy caliber weapon or a light cannon. Fragmentation - The disruption of the bullet into many pieces caused by the forces of impact on the bullet. Full Jacketed - A bullet designed with the core of the bullet completely encased in a metal jacket to prevent expansion of the bullet upon impact. Fully jacketed bullets generally give the deepest penetration of any bullet design, all else being equal. They can be constructed with a lead core and a very thick copper or stell jacket, or they can be a solid metal bullet, usually made of copper, bronze, or gilding metal, known as a monolithic solid. Geneva Convention(s) - Some people claim that the use of “hollow point bullets” is illegal in warfare under the Geneva Convention (which is a set of international agreements to provide for “civilized” behavior between nations at war). The topic was actually addressed by the Hague Accords of 1899 and 1907 and proscribed the use of “arms, projectiles, or material of a nature to cause superfluous injury” (or in some documents “unnecessary suffering”), and neither term is defined. The conventions also only apply to a declared war against national enemies by signatory parties. The US is not a signatory of this convention, but does abide by it. Hollow Point - A bullet (usually of jacketed construction) designed with the core of the bullet exposed by means of a cavity in its nose to facilitate expansion upon impact. Actual expansion can be altered by intervening material or by the bullet’s construction. In regards to the use of “open tip match” bullets which provide increased accuracy and which are not specifically designed to expand, the Hague Convention IV of 1907 (and NOT the Geneva Convention) does not proscribe bullets which yaw and fragment in tissue. This position was not disputed by the 1978 UNCCW Conference and was reconfirmed during its review in 1994 - 1996. Thus the US Judge Advocate General office’s 1990 decision to authorized certain OTM projectiles, which yaw and then fragment just like many FMJ bullets, for unrestricted land warfare use is perfectly legal under international law and neither the UN nor any other organization have any grounds to protest their use. If one wanted to get technical about this issue there is really no basis for proscribing a bullet that does expand, since a) there is nothing about them that causes “unnecessary suffering,” and b) an expanding bullet is simply an attempt to make a small diameter bullet create a wound channel that a larger diameter bullet would. Regardless, most “expanding” bullets create a less messy wound then fragmenting bullets do. In actuality this so-called “ban” is very misleading, for while expanding projectiles may supposedly be proscribed, the use of mines, explosives, fragmentation, and flame weapons which indiscriminately shred and maim their victims are not. Permanent Cavity - The permanent “hole” left in the target by the bullet’s passage. It is caused by the crushing and cutting effect of the bullet. Depending on the bullet’s design it can be quite large in diameter or hardly noticeable. Pointed or round nose non-expanding, non-tumbling bullets make the smallest holes. 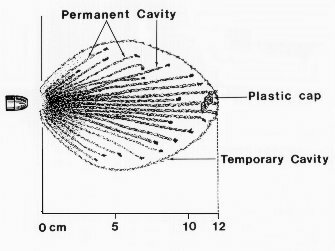 Penetration Depth - The final depth of the projectile’s penetration at the end of the permanent cavity. Semi-wadcutter - A bullet designed with a sharp bore diameter shoulder that enhances its cutting action without requiring expansion. Soft Point - A jacketed bullet designed with the soft core of the bullet exposed at its nose to facilitate expansion upon impact. Softpoint bullets tend to give slower expansion and deeper penetration than hollow points all else being equal. Actual expansion can be altered by intervening material or by the bullet’s construction. Stopping Power - A popular but imprecise term meaning Wound Trauma Incapacitation. 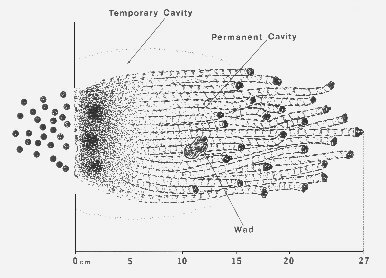 Temporary Cavity - The boundary of the temporary displacement of tissue by the hydrostatic effect (fluid pressure) of the bullets passage. Wound Trauma Incapacitation (WTI) - The inability of a human or animal to continue purposeful action due to the effects of being struck by a penetrating missile. The subject of incapacitation is one of vital interest to anyone who depends upon a firearm to either protect their life from an assailant or who needs to stop a dangerous animal. What is needed in both cases (and even in the case of a non-dangerous game animal) is to turn off - stop - whatever the target is attempting to do, whether it is trying to kill you, someone else, or simply trying to run away. Whether or not the target eventually dies of the wound(s) is of only academic interest at the moment the shot is fired. You want (need) instant (or as near to instant as you can get) results! This function is commonly referred to as “stopping power” but a more precise term is Wound Trauma Incapacitation (WTI). For a long time many individuals believed that the mechanism of incapacitation was either energy transfer (how many foot-pounds of bullet energy was dumped into the target), the size of the temporary cavity caused by the “shockwave” of the bullet’s passage, or as some writers would have you to believe, the brand of ammo (usually the brand that they were getting free). However, modern medical science has shown us that the mechanism of incapacitation, while still not completely understood, is based on two components. First is the permanent tissue and nerve destruction caused by the the cutting and crushing action of the bullet’s passage. In other words, making the biggest diameter and deepest hole that you can. The other component is not as easily as quantifiable and is the physical and emotional state of the target. A target pumped up on adrenaline or affected by narcotic or psychotic drugs can be extremely resistant to bullet-caused trauma, while a target full of fear and self-doubt may “cease and desist” from a very minor wound. Since we cannot control the target’s physical or mental state we have to just worry about doing all damage that we can to the target. Some will state that bullet placement is also a component. While in actuality it does play a part in the final results, it is not a component of ammunition/bullet performance. A well placed hit that causes inadequate damage may be of infinitely less use than one that causes massive and deep damage in a less well placed hit (although, ideally what you want is a well placed hit that cause massive damage). Let’s look at some of the theories, past and present. Energy Transfer School - In this school of thought the more foot pounds of kinetic energy a bullet “dumps” (loses) in its journey through the target, the more effective it should be in incapacitating the target. The measurements were derived by measuring the bullet’s velocity at impact and also its exit velocity (if any) and then comparing the kinetic energy of the projectile at those two velocities. The difference was considered the energy transferred to the target. Under this theory a .22 Long Rifle bullet which did not exit the target could be more “effective” than, let’s say, a .357 that blew right through the target (while this is an extreme example you get the point). What the bullet did to the target while traversing it was not examined. This school of thought favored light-weight high-velocity bullets which possessed high kinetic energy and which usually did not exit their target. To give you an idea about problems with this idea, “authorities” have stated that delivering between 35 and 270 ft/lbs of energy is “effective.” That’s almost a 9× discrepancy and there has never been any scientific or medical proof that KE does anything to soft targets. One of the most famous of the energy dump studies was done by DeMaio, in the late 60’s. Temporary Cavity School - In this school of thought the larger the temporary cavity made by the bullets passage, the more effective it should be. The measurement of the temporary cavity was derived by measuring high speed x-ray photographs of the temporary cavity displaced by the bullet on the theory that the farther tissue was displaced the greater the nerve trauma. The actual damage done by the bullet was ignored. In general, the faster the bullet is traveling the greater the temporary cavity, all else being equal. Several things have proved wrong with this theory. First of all, as any surgeon knows, muscle and bowel tissue is very elastic. During surgery such tissue can be moved substantial distances without any harm to the person. Second, most temporary cavities are quite shallow (although bullet design plays a role here) and thus do not effect much in the way of vital organs. Third, the temporary cavity is not very large with pistol rounds (not much greater than about 4″ in diameter) and of very short duration. Unless the limits of elasticity are reached (which take velocities in the 2700 f/s and higher range) no permanent damage or injury results. The exception to this is inelastic tissue such as organs like the brain, liver, kidneys, and spleen - but counting on hitting one of those organs is a risky business. This school also tends to favor higher velocities, although bullet construction/performance is also considered. The most famous of these studies was the “Relative Incapacitation Index” study done by the the National Institute of Law Enforcement and Criminal Justice in the early 70s using their “computer man,” and which was almost immediately invalidated due to false assumptions, blatant data errors, and the use of 20% gelatin. It should be noted that there is, however, an instance where the temporary cavity may aid in the WTI process. 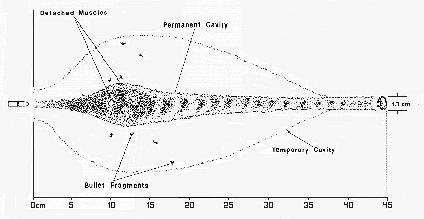 That instance is when the a high velocity (> 2500 - 2700 f/s) rifle bullet fragments during the creation of the temporary cavity. 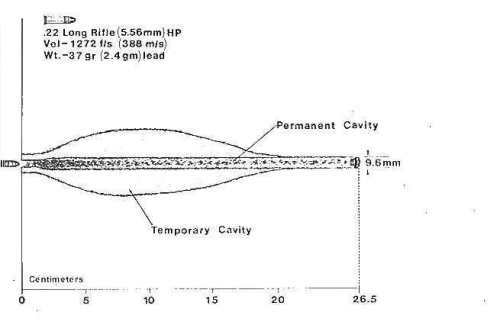 Temporary cavities from most high power rifles can be 5 - 8 inches in size, and this can sometimes cause the tissue to suffer somewhat more damage than by just the bullet’s passage alone, as the tissue can be cut or damaged during its stretched or stressed state by the bullet fragments and thus create a somewhat larger permanent cavity. If the wound is deep enough this can increase the incapacitation effect. This effect is seen with the military ball ammo fired in the full-sized M16 rifles. The “Hydrostatic Shock” School - This school of thought, which is sort of an adjunct to the temporary cavity school, thinks that the “hydrostatic shock” or hydraulic pressure wave of the bullet’s passage travels throughout the body and shocks the brain and nervous system into momentarily shutting down, which disables the target. Tests have been run with instrumented pig carcasses and other than the immediate vicinity of the bullet’s passage significant hydraulic effect was not noted. Big Hole School - In this school of thought, sometimes referred to as the Fackler/IWBA school, and the medically correct one, the more permanent damage that is done to the target (and incidentally the more rapidly the target bleeds out) the more effective the bullet and likely incapacitation. The more tissue cut, crushed, and/or destroyed by the bullet’s passage the better, as more real system trauma results. In addition, in order to be effective at all target angles, the bullet must penetrate sufficiently to reach vital organs in the target no matter what direction the bullet impacts from. Most authorities agree that for anti-personnel use a minimum penetration in calibrated ballistic gelatin of about 12″ (with 14″ - 15″ being considered ideal) is needed. This is necessary to achieve reliable performance under all conditions against a human target. It should be noted that minimum depth for major blood vessels and organs in a human is about 15cm (6″) from straight-on, but it is considerably more from various angles. With bullets used for hunting the general consensus is the deeper the better. In both cases this has to be coupled with the ability to create the largest diameter permanent hole possible. Most authorities seem to agree that the permanent hole needs to be at least .4″ or greater in diameter and as deep as possible. A problem arises here in that as a bullet expands it tends to penetrate less, so expansion and penetration have to be carefully balanced by bullet weight and bullet construction. This bullet design problem is exacerbated by the fact that if a target is covered by some material such as cloth, glass, metal, etc… the expansion - and hence the penetration of the bullet - can alter dramatically. An average penetration of 14″ - 15″ in 10 percent bare gelatin. Velocity of between 800 and 1000 f/s. Maximum practical bullet weight for the caliber, (9mm - 147gr, 10mm - 180gr, .45 ACP - 200-230gr) with a preference for the larger diameter (.40″ or greater) bullets. A Quick Note on Bullet Diameter - Some folks who think the 9mm is the perfect round say, “how can a ‘silly millimeter’ between a 9mm/.355 and a 10mm/.40 make any real difference?” What they are missing is the fact that it’s not the diameter that’s important, but rather the area of impact that determines the amount of damage produced - the reason we like to use expanding bullets. Note the percentage of impact/damage area increase as bullet diameter goes up. Since expanding bullets frequently do not expand, it makes sense to start with a bullet diameter you’d like the 9mm bullets to expand to. Incidentally, round or pointed nose, non-expanding bullets tend to push tissue aside rather than crush it, and the permanent cavity for a non-tumbling bullet of these designs usually runs about 65 - 70 percent of the diameter of the projectile. Non-expanding heavy jacketed or monolithic (solid metal) projectiles with large metplates yield permanent cavities of between 70 and 80 percent of the diameter of the projectile (and the large metplats helps them to penetrate in a straight path rather tan veer off). The very blunt and often sharp-edged shape of an expanded projectile can yield a permanent cavity of between 80 - 90+ percent of the expanded projectile’s diameter. Bullet expansion, in and of itself, was rewarded. Thus a 9mm bullet that expanded to .45″ was rated as more effective than a .45 cal bullet that did not expand even if the wounds were identical. Penetration depth of 12″ was awarded a value of “1” while a penetration of 11.9″ was given a value of “0,” the same as a penetration of 6″. The FBI has since stopped ranking the ammunition and has just started to publish the test results themselves. I personally think that a ranking system based solely upon a combination of actual penetration depth modified by the average dimensions of a human torso (to discount cavity volume outside the depth of a torso), and the volume of the permanent cavity might make a useful ranking system if the statistical caveats could be worked out. One word about depth of penetration. Some people in law enforcement hold that too much penetration with ammunition used for self defense is a bad thing. They warn that a bullet that passes through a target may hit someone else resulting in all kinds of law suits. However, considering that according to action reports from the NYPD that 80 - 90 percent of the shots fired in law enforcement situations fail to even hit the target (Gunsite, Thunder Ranch, and a few other school grads excepted! ), I wouldn’t worry too much about if your ammo is penetrative. Better too much than not enough when the chips are down. However, ammunition that meets stated requirements above for optimum performance will in most circumstances not exit with a frontal torso hit. Interestingly, the big hole school has always been accepted in the dangerous game hunting field as the way to go, yet for some reason tissue damage and deep penetration have taken a while to be accepted by handgunners. Maybe the reason that energy dump and temporary cavity believers aren’t vocal in the hunting area is that it is hard to talk when you are in between the toes of a cape buffalo or in a lion’s or bear’s stomach. Another interesting observation is that much of the existing medical literature on bullet wounds is still full of misconceptions and false statements. While things seem to be slowly improving, there is quite a way to go for medical literature to catch up with the truth. The Bullet of the Month School (The Magic Bullet School) - This school of though is pushed by the unscrupulous manufacturers of some bullets that they claim are magic, and the gun writers who receive free samples and other perks that laud them without scientifically testing them. These include things like bullets made of esoteric substances (like the “blended metal” bullets) and bullets with unusual shapes, construction (“exploding” bullets), or other properties. Most are things that were dreamed up long ago and have been resurrected in an attempt to make money, and are consistently shown to be no better, and often worse performers, than more conventional designs when tested. 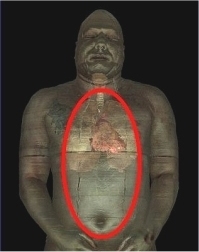 A couple of things to note in regards to damaging the “target.” First the vital organs in a human torso are placed much higher in the chest than many people believe, and your aim point should be between the armpits rather than “center of mass” when shooting a human adversary. 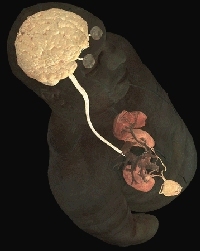 Second, the central nervous system is actually not very large and is difficult to hit. 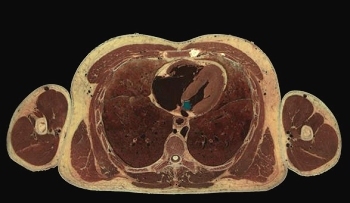 The graphic below shows a cross section of a human torso. Note that for a bullet to be able to reach the vital organs from any direction except directly from the front, a bullet will have to penetrate quite a bit. The average torso is between 10″ and 12″ thick front to back, and while a 6″ penetration may get the vital organs from dead front, any shots from the side will have to penetrate significantly more. This means that a bullet should have a penetration of 12″ or more to be affective from any angle. 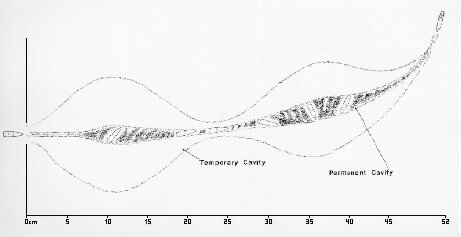 One of the tools used to compare the effects of ammunition is the “wound profile.” Wound profiles are simply dimensioned photographs or carefully prepared scale drawings of test firings in calibrated ballistic gelatin. 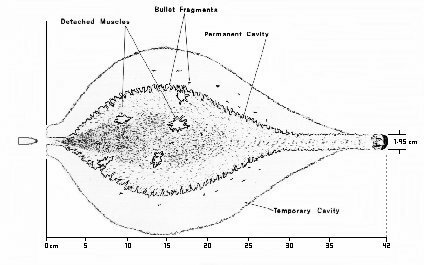 The wound profiles below are some typical examples of what a bullet does on impact. Surprisingly, more work with wound profiles has been done with handgun ammunition than with rifle ammunition used for hunting. This is a fertile field for researchers. Properly prepared and calibrated ballistic gelatin gives performance and penetration results within about 2 percent of results obtained in actual tissue. “Properly prepared” means that the gelatin is a 10 percent mixture of ballistic gelatin (Kind and Knox Type 250) prepared with water heated to no more than 104° F (40° C) and then stored and shot at a stabilized 39° F (4° C). This particular profile is that of an early .45ACP 185gr Silvertip Winchester at 940 f/s. This is a classic non-fragmenting expanding bullet wound profile. The narrow portion at the start of the permanent cavity is called the “neck” and its length is a function of the bullet’s design. This particular load is a little short on penetration at 25cm (9.8″) with an expansion of .85″. As a comparison the Hornady +P 230gr XTP at 880 f/s gave 15.6″ penetration and .72″ expansion, the Hornady 200gr XTP at 850 f/s gave 18.5″ and .54″, the Winchester 230gr Black Talon at 858 f/s gave 13.5″ and .73″, and the Remington 185gr at 1020 f/s gave 10.5″ and .83″. Interestingly, Winchester must have got the word because a later lot of this ammunition gave 882 f/s and 11″ of penetration and .74″ expansion. 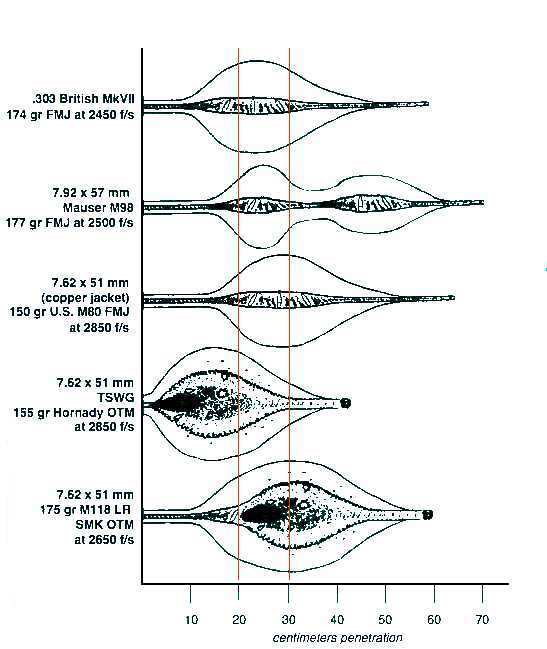 For comparison the GI M1911 Ball ammo (230gr FMJRN at 869 f/s) produced a penetration of 26″ with no expansion. This particular profile is that of a .38SPL +P 158gr lead semi-wadcutter hollow point “FBI” load at 880 f/s. This is another example of a typical non-fragmenting expanding bullet wound profile produced by an expanding bullet. This particular load shows good penetration at 32cm (12.6″) and good expansion at .59″. Perhaps this is one reason that this loading has a good reputation on the street. The Winchester Black Talon 9mm 147gr JHP at 981 f/s produced an almost identical profile with penetration of 35cm (13.8″) and and expansion of .61″. In the .40 caliber ammo the profiles were very similar with the Hornaday 155gr XTP at 1090 giving 14.3″ penetration and .57″ expansion, the 180gr XTP at 970 f/s giving 14.5″ and .67″, and the Winchester 180gr Black Talon giving 13.4″ and .68″. This profile is the Remington 125gr JSP .357 Magnum at 1390 f/s which has an excellent reputation on the street. 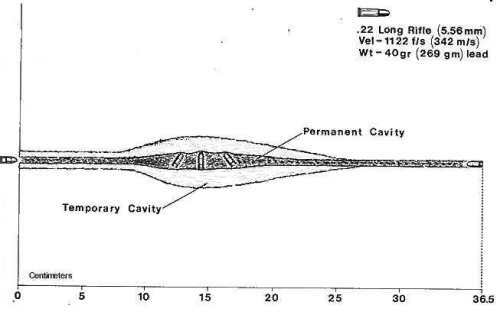 Note the shape and size of the temporary and permanent cavities are very similar to the .38 Special round above and penetration is only about 1.5″ greater. Expansion is .66″, only .07″ greater than the .38 round in spite of the vastly increased velocity. An excellent example of good bullet construction at work. The equivalent JHP round gives about 10 percent less penetration and a .70″ expansion. This is the 9×19mm NATO M882 124gr FMJ round and is typical of small diameter round nose FMJ projectile. Note that the permanent cavity is very small and the projectile doesn’t start to tumble until about 20cm of penetration. Not impressive nor effective in spite of the 1200 f/s velocity. This profile is the M855 5.56mm NATO cartridge, with a 62gr steel core FMJ boat tailed bullet at 3035 f/s. This is a classic fragmenting rifle bullet profile. Penetration is acceptable at 34cm (13.4″). Note the long narrow neck of about 9cm (4″) before the bullet tumbles and fragments. The length of the neck can vary from 9cm to about 20cm depending on impact velocity (one of the reasons for its erratic performance). The original M193 55gr round produces a similar profile but it has a longer neck, and slightly smaller temporary and permanent cavities. Both of these bullets fracture violently at the cannelure at velocities above about 2700 f/s. Below that velocity the bullets may break into several large pieces or simply tumble without producing the extensive permanent cavity, much like the 7.62mm M80 ball round. This is the profile from the 6.8 SPC (6.8×43mm) with the 115 gr Sierra Enhanced Fragmentation OTM bullet at 2620 f/s. Note the short 6cm neck, good fragmentation, and permanent cavity. If the bullet expands rather than fragments the profile is very close to this with a slightly shorter neck and a tail that goes straight with a penetration between 35-38cm. This is the wound profile of the 7.62×39 PS Steel Core AK-47 round at 2340 f/s. Great penetration but otherwise not very impressive, eh? 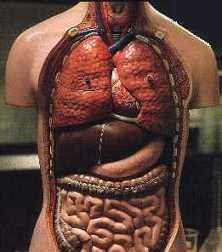 The permanent cavity is flat in cross-section. I removed two sections at the left and right sides so the image would fit on the page better. At around 60cm the bullet yawed downward and wound up base first as shown. This is the profile of the 5.45mm AK-74 round at 3066 f/s. The lack of fragmentation makes a smaller permanent wound cavity than that achieved by the M16. However, penetration in flesh is better because of no fragmentation. The permanent cavity is actually flat in cross-section due to the long narrow bullet’s tumbling so it is not as effective as the M16 rounds. These are 2 profiles of M1 carbine loads. 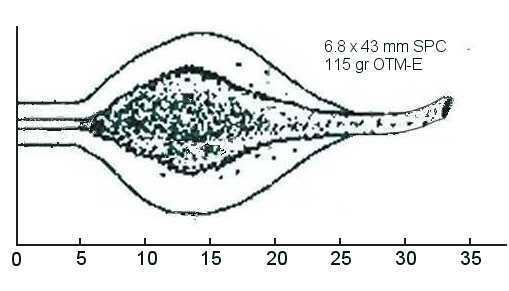 The 110 gr softpoint load makes a wound similar in diameter to a .357 Magnum carbine round with substantially more penetration. The GI ball load makes the typical slit permanent cavity of a tumbling projectile, with the cavity past the typical thickness of a human torso. This profile is the M80 7.62mm NATO cartridge, a 149gr FMJ boat tailed bullet at 2730 f/s. This is a classic FMJ military bullet profile for modern non-fragmenting/non-expanding spitzer bullets. The bullet ends up base first at a penetration of 25.6″. The permanent cavity is flat in cross-section. Note the long neck before the bullet starts to tumble, but in this case at only 2700 f/s and with its heavy jacket the bullet doesn’t fragment. Interestingly, if this bullet is driven at 3000 f/s it fragments and behaves just like the M855 5.56mm bullet. Have you noticed the trend for FMJ spitzer flat base/spitzer BT bullets that do not fragment to end up base first? This profile is of the Winchester .30-30 170gr Silvertip at 2020 f/s. 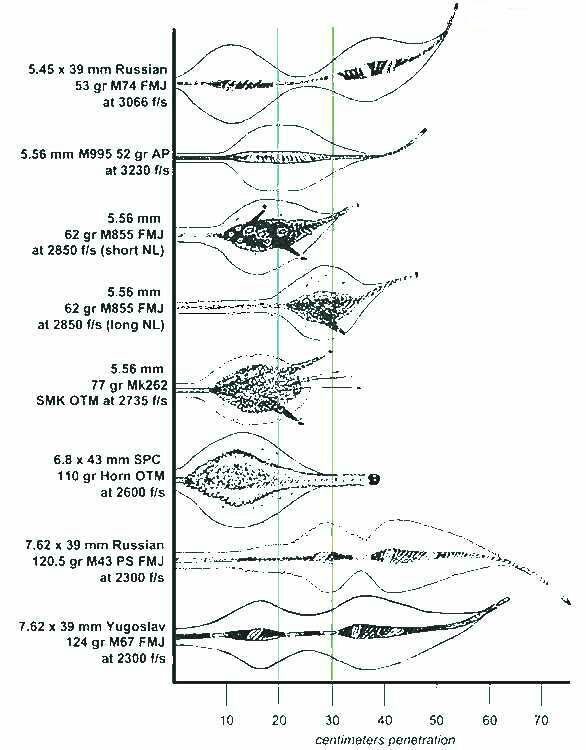 This is typical of medium velocity, expanding rifle bullets. This profile is of the Winchester .30-06 150gr Softpoint at 2923 f/s. Note the larger permanent cavity than the .30-30 but almost identical penetration. Not something you want to get shot with. This profile is of the wound created by a 12ga. 27 pellet #4 buck at 1350 f/s. Penetration depth of the deepest single pellet is only 10.6″ with the majority between 6″ and 10″, which corresponds to the known performance of #4 buck - in another word, erratic. #1, 00, or 000 buck are a much better choices giving penetrations of about 13″, 14″ and 15″ respectively for standard lead buckshot. While I don’t have any profiles available, reports I have received from testers indicate that the use of hardened and/or plated buckshot can provide about a 10-15 percent increase in penetration due to the lack of pellet deformation with the harder pellets. 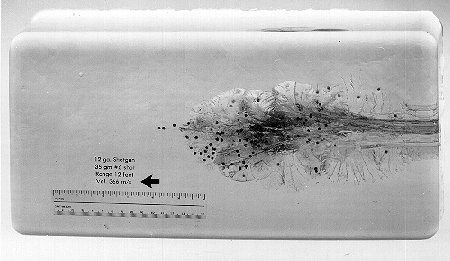 This is an actual photograph of the wound created by a 12 ga load of 1¼ ounces (about 169 pellets) of #4 shot (not buckshot) at 1200 f/s. The maximum penetration is about 11 inches but the majority of the shot is located between about 5½ and 7½ inches. The damage pattern is typical of shotgun wounds at field distances. Number 7½ shot gives about 4 to 5½ inches. This profile is of the 12ga 1oz (437gr) rifled slug at 1513 f/s. That’s about a 1″ wound channel and 14″ of penetration! Observed penetration for Foster type rifled slugs ranges from 14″ to around 18″ depending on brand and hardness. No wonder some professional hunters like the 12ga slug as a bear stopper at close range. However, the soft lead slug doesn’t fare too well on hard targets. If every bullet made a permanent cavity like this we’d have less discussion on wound trauma incapacitation. The .22 LR round nose lead. Note the typical tumbling of the projectile. If the nose is filed flat it behaves like the HP round below. .22LR hollow point. Note the straight penetration and permanent cavity. The above are some scaled comparisons for common military “assault rifle” and “battle rifle” rounds. This profile is of the so-called “wonder bullet” the .357 Glasser Safety Slug, 80gr prefragmented bullet at 1785 f/s. This is typical performance of the ultra light weight, high velocity and prefragmented bullets in general . Note the very shallow penetration (4.7″). I’m not impressed, are you? While the energy dump and temporary cavity schools of thought have been disproved, some folks still cling to the temporary cavity theory. Perhaps the real answer lies somewhere between the two. There are many failures of both the high performance/high velocity temporary cavity loads (especially the lighter bullet weight loadings) and also the big bore/big hole loads. While general experience seems to favor the big hole loads, nothing is certain. A lot still depends on the condition of the target. Regarding the comparative virtues of various calibers, using hollowpoint ammo: it is absolutely undeniable that, while a 9mm or .40S&W may or may not expand, a .45 will never shrink. One famous case of small and fast failure (temporary cavity loads) was widely distributed in law enforcement training circles. An individual received an incredible number of 9mm expanding bullets (somewhere around 36 - all over his body including the chest and face) yet was not seriously inconvenienced for several minutes. Another similar case was the infamous FBI Dade County shoot-out wherein one of the aggressively behaving antisocial misfits was hit solidly with a “high performance” 9mm 115gr JHP. Though the wound would have eventually proved fatal, it failed to penetrate deep enough. He was able to continue fighting and killed several agents with a rifle before being taken out of the fight with a more powerful and destructive load. As to “big hole” failures, in NJ there was an incident in the late 60’s that shook a lot of folks. A drugged-up individual was shot through the back door and seat of a van he was driving with a 12ga slug. He exited the van with an inch-and-a-half hole blown clear through his chest. He ran about 25 yards firing his pistol at his pursuers until he collapsed. (And you thought you were well armed with your 9mm/.357/10mm/.45, eh?) Check the wound profiles above for the 12ga slug and compare it with a pistol bullet profile. Then ask yourself if you will ever feel well armed ever again. Under those circumstances a tactical nuke might have been needed to provide the desired WTI. In the hunting area, I’m sure that you have heard of accounts of Cape Buffalo receiving well placed hits of tremendous size and power (500 grains at 2000-2400 f/s), and who yet turned on their antagonist with malice and lethal intent even though they should have, by all rights, been dead on the spot. Bullet hits to the torso that do not cut the central nervous system cannot be counted upon to cause a person (or for that matter a game animal) to immediately cease all actions. Even a total loss of blood flow to the brain can still allow 10 seconds of purposeful action - that is more than enough time to empty a magazine into you, or to stomp you to death. Purchase a consistent, robust performing duty load (that feeds reliably in your weapon and that expands when fired from your barrel length) in sufficient quantities for your use and stop worrying about the nuances of handgun ammunition terminal performance. …and then there is always the Mozambique drill. But that’s another topic. Discalimer - As far as I know all the information presented above is correct and I have attempted to insure that it is. However, I am not responsible for any errors, omissions, or damages resulting from the use or misuse of this information, nor for you doing something stupid with it. Throwing Lead thinks it is important to remember that there are more decisions that go into choosing a handgun for self-defense than just caliber. While I don’t necessarily dispute any of the above author’s statements or positions, I would like to add the following because I think it is important, especially for the less-experienced, to keep these factors in mind. Bigger is definitely better when it comes to WTI. However, shots that miss don’t count. In other words, if you can’t hit your target, it doesn’t matter how big the bullet is. Don’t use a caliber you can’t handle. Certainly, most normal, healthy adults can be taught to be effective with any number of pistols chambered in larger calibers. That being said, a larger caliber still might not be the best choice, for several reasons. Guns chambered in larger calibers tend to be bulkier and heavier, and those that aren’t, tend to recoil more. You might not want to carry a heavy gun (try walking around with a 2.5 pound weight on your belt for a few days - you will quickly learn the importance of a good gun belt). Larger guns are harder to conceal and you might live in a warm climate. Your pistol won’t do you any good if you left it in your safe because you couldn’t conceal it. You might be sensitive to recoil, or have an injury or some other condition like arthritis that makes shooting a larger caliber uncomfortable. Of course, plenty of smaller calibers can have pretty bad recoil too, depending on the firearm itself and the person shooting it. The point is, what you are using the firearm for, and how you will carry it should play into your decision. One benefit to smaller calibers is that they generally have a greater capacity. Many large caliber pistols are limited to 7 or 8 rounds. And yes, if you can’t handle a threat with 7 rounds, it might very well not matter if you have a hundred. But still, there are scenarios where it would be beneficial to have 14 or 15 rounds without requiring a reload (I’ve seen more than one case where someone was accosted by 3 or 4 individuals). Assuming shot placement is key, have you trained sufficiently to ensure all 7 shots are in the A zone? If you haven’t, is it because you don’t like shooting your firearm? Lastly, it is my opinion that the 9mm cartridge is an effective self-defense round when using a good hollow-point bullet (e.g. the Speer 124gr +P GDHP). Plenty of people have managed to defend themselves quite successfully with 9mms (and smaller), all over the world for decades. Yes, all other things being equal, a .45 will make a bigger hole, and give you better WTI than a 9mm or smaller. But don’t kid yourself, no pistol caliber is a “one shot man-stopper.” You should know at least that much from the above (that’s what rifles are for). However, at the end of the day, when it comes to self-defense, I’d still take a .380 (or even a .22 for that matter) over nothing.